We start off our first guide about the amazing world of Football Manager Scouting by taking a closer look on the different scout roles’ key attributes – providing you a better understanding on how to find the best scouts in Football Manager. This elementary guide discusses the different aspects of the Football Manager scout attributes and which scout roles they are required for, in order to assign more reliable scouts. Passion4FM divide the types of scouts needed for a successful scouting network into four different roles according to their main responsibilities and tasks. As we have previously discussed the importance of scouting and increasing the level of world knowledge in terms of improving the level of regens received from the annual youth intake, lets put focus on the Football Manager backroom staffs which shall expand the clubs knowledge and provide you with accurate team and player reports. Read more about the key attributes for the different scout roles below. When trying to find proficient and efficient scouts you will need to know their key attributes, and what divides the best scouts from a terrible one. It’s time to analyze which staff attributes that’s important to determine their reliability for them to provide accurate reports when evaluating new talents or transfer targets – what that determines their excellence and performances – how good they are at doing their job. For a scout to deliver accurate reports of players there are two key attributes needed for all Football Manager scouts – no matter role. We categorize them as main overall scouting attributes. The additional attributes discussed further down will be of importance according to their specific tasks and main responsibilities. In the end it’s the answer to what distinguish general scouts to the role of a chief scout, or the overall responsibilities of a next opposition analyzer. 1) Judging player ability (JPA) – is an indicator of how accurate they can predict a certain players current level of ability. How good is the player at the moment? Is the player at the same level as your current squad, worse or even better than your existing team? Judging player ability is a good staff attribute if you need to immediately strengthen your first team. This scout attribute is vital for finding suitable targets over the age of 23, as it determines the current ability of the player and his level of play, more accurately. 2) Judging player potential (JPP) – is an indicator of how accurate they can predict a certain players potential – How far can the player go in the world of Football Manager? How good can he become? This attribute is important if you intend to assign the scout to identify the next generation of football talents – players under the age of 23 with unfulfilled potential. A good rating of JPP determine how fast and accurately the scout predicts the potential star rating – the level of and difference between gold star potential rating and black star hidden potential rating. Judging Player Potential is a vital attribute for all scouts, perhaps equally important as determination, as we want to know how good the players can be, not how good they are right now. If you’re aware of a players potential, it is much easier to compare him to your current crop of players and make a final decision of him being valuable for purchase. If you have two equal players, but one of them seems to have higher potential, it is natural to go for the latter. an accurate scout report. But regardless of attribute rating, you will always need to scout a player a number of times to get the report as accurate as needed to make a final judgement before bidding on a specific player. Through numerous reports you will find out more about his personality, strengths, weaknesses and his player preferred moves (PPMs). A chief scout will need better skills in Judging Player Potential and Judging Player Ability than the rest of your scouting crew, as you can rely on the chief-scout to make the final judgement about a player or deliver you a second opinion about an interesting player. A good chief scout should have a decent level of scouting knowledge according to your preferences and club level. In Football Manager 2015 this matter is even more important than before. Now you need 100% knowledge of a player in order to determine his potential ability, which is determined in the final percentage, and get the full list of pros and cons in the player report. A) Determination will determine his scouting frequency; how often he will give reports, and how quickly he will fulfill his assignments. For example: a scout with 17 determination will be much quicker to fully scout the whole region of Central Europe than a scout with 12 determination. How fast they will complete a region or a nation will also depend on the staff attribute adaptability, which we will look closer into later on. A good level of determination for a chief-scout is 15 or more, but when managing a lower league club it’s hard to attract chief-scouts with that high level of determination, so try to set the limit to at least 10. B) Tactical Knowledge is useful when you like accurate reports of your next opposition. Higher knowledge of the tactics, combined with judging player potential and judging player ability will give you better understanding of your oppositions ratings, main threats and weaknesses etc. There are also some scouting attributes that are important for the different types of scouts, which we will talk about later on. These attributes depend on what you like the (chief) scout or scouting network to do; their primary job and/or assignments. C) Adaptability Determines how quickly he will settle in a completely unknown region or country. It may be a nation or region that is very different culturally from his birth nationality and scouting knowledge. Level of adaptability will determine how quickly he will settle and start providing you with a good number of reports. For example, a scout with 11 adaptability with only the knowledge of Brazil, will take a while to settle in a new country and recommend suitable targets if he should scout the region of Middle East, as opposed to one with 18 in adaptability. No matter of level of adaptability, all scouts will eventually increase the knowledge of a specific nation or a region. The higher the level the faster he will provide scout reports, but a lower level of adaptability will take longer time to complete the assignments. Having 3 or more scouts with a level of over 15 in adaptability is vital when roaming regions and new countries. For future reference, scouts with high adaptability will be referred to as “Roaming-scouts”. D) Man Management is more a staff attribute which is linked to coaching and required by assistant manager and reserve managers. But as I see it a Football Manager chief scout will require man management as he is responsible for setting up scouting assignments for your network and manage the scouting team. As the head of scouting he needs to keep the crew happy and organize the entire network by setting up assignments which suits the scout. I tend to look for chief-scouts with a minimum level of 10 in man management. It will indicate that he will setup the scouting assignments in a better way, which might increase your scouting knowledge. – Lower league management will not allow you to acquire scouts with the highest ratings of scouting attributes as the scouts has reputation above national. We recommend to try to sign staffs with as high ratings in the attributes named above as possible. – You should always try to maximize the limit of backroom staff allowed and extend the limit of scouts that your board allows you to have. You can do it by interacting with the board in the backroom staff . When looking at your backroom staff roles screen in Football Manager or are searching for a new staff you will experience there are two different types of scouts – the general ones and chief scouts. But for me the amount of scouting roles are in overall 3, as there are 2 types of general scouts which I look for when assembling my crew. Each role will have their specific job based on their main strengths, and will be set on specific assignments in regard to their best attributes. When assembling your crew, including hiring a good chief scout, it’s important to first look at your clubs present world knowledge. It would be little useful to buy quality scouts with the same scouting knowledge as your clubs nation, unless they have excellent adaptability which makes them able to adopt to new regions and cultures quickly. Below we will take a deeper look into the different scout roles and which key attributes they require for their main responsibilities. The Chief scout is the head of the scouting network and his solely purpose is to filter through all the different scout reports and update you on recommended targets. His responsibility is to setup scouting assignments for the others and manage the network. Here I always go for a man with long time experience, decent level of reputation and a scouting knowledge of nations which are likely to produce the best regens, as I want full knowledge in these countries. You can read more about the different scouting regions and nations level of youth rating, which influence on the regen production, here. His present scouting knowledge, before entering your club is highly important as you want to find a chief-scout who can increase the clubs knowledge just by his present experience. Since I use him as a consultant, he will have very few scouting assignments on his own, but if I use him I tend to assign him to scouting locally regions or the clubs national league. For example if you’re managing a club in France, I let him either scout the country of France, one of its divisions or the region of central Europe. When searching for good chief scouts I tend to set the levels of Judging player potential and ability to a minimum of 16 for top division clubs and 10 for lower league clubs. By downloading our backroom staff search filter below you will be able to see how I filter the different scout attributes according to role. Roaming scouts will need excellent adaptability as they will travel all over the world to find new targets. When assembling your scouting network you would want as many roaming scouts as possible to increase your scouting knowledge. Their present scouting knowledge is of no importance, as their level of judging player potential and determination is there to improve it rapidly. But of course this statement is kind of two-sided, especially if your clubs current knowledge is very poor; then it’s vital to increase it by finding scouts with knowledge who can extend it current level as well. When assembling your scouting network it’s important to find scouts who fulfill each other and who add depths to the current clubs knowledge. You will need a plan to finally cover all regions of the world. So if I’m managing a club in Norway, I will try to approach scouts with knowledge of Denmark, Sweden, England and Belgium (neighbor countries and/or regions like Central America where I can find bargains and affordable players which has the ability to improve the current squad). A good roaming-scouts has excellent determination and adaptability. When looking for excellent prospects for this role I tend to set the levels of Judging player potential and ability to a minimum of 14 for top division clubs and 10 for lower league clubs, while adaptability is normally around 2 points higher. Next Opposition scouts will only have one scouting assignment; analyzing the next opposition and providing valuable data about their players, preferred tactics and providing report cards of the next opponent. When searching for good next opposition scouts their staff attribute level of tactical knowledge is highly important, in addition to judging player ability. Appointing one staff for this role is more than enough, and can be handled by your chief-scout. We will take a closer look at analyzing your next opposition and look closer to the report card of next opposition in a later article. Youth Scouts will have a specific assignment to find new talents and stroll through the world looking for new potential wonderkids. These scouts will require excellent adaptability and high judging player potential as their main responsibility will be to find talents under the age of 18/19. Their level of judging player ability is not that important, but should be a decent level, so they can make a good comparison to your existing youth players. 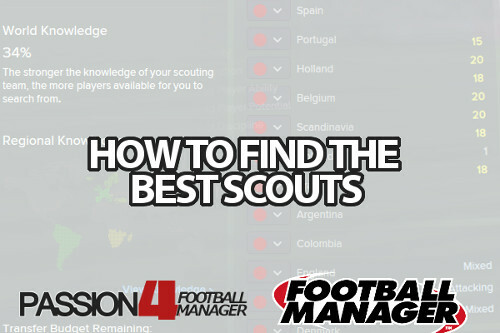 How to find the best scouts in Lower League Management? Now a quick and helpful tip for you Lower League stalwarts. Playing as Mandalskameratene, Kirklarelispor or Polonia Bytom, (yes, you’re supposed to have never heard of these clubs) you will never be close to hiring good scouts at the start of the game. What do you do to get a good level of scouting when managing in lower leagues? Aim for an assistant manager with as high judging player potential and/or judging player ability as possible. Then, rely on your scouts to have as high Determination as possible, if you’re unable to find targets with good JPP and/or JPA. This will mean they will deliver lots of reports, that you sift through on your own. Then, whenever a scout delivers you a 4.5 or 5-star report, scout him again with your assistant manager to be more assured of a player. After all, an assistant manager with JPP 13, is a good “second opinion-er” than a scout with JPP 8. To summarize: it is better for a minor club with low reputation to have a scout with JPA 7 and determination 11 than the other way around. 1. Put up an advert in the Job Centre which will attract all scouts (or chief-scouts), who wants to join your club. This option might not be the most reliable, as it takes a while to gather applicants and they tend to have quite poor attributes, as they often are unemployed. 2. Setup or download a staff search filter, either by main staff attributes for a good chief scouts or filter by their staff role. Luckily for you we have already made a staff search filter, so you can find the best scouts according to the different roles. This option will give better results in less time. It will be necessary to adjust (increase/decrease the parameters) the filter according to the reputation and playing level of your managing club.